Christopher Keefer, surrounded by his wife and two daughters, speaks at the memorial service for his son Sean on Friday. Sean Keefer was found dead Tuesday in his West Hall bedroom. Updated Jan. 25 at 4:30 p.m.
Sean Keefer’s twin high school-aged sisters had always looked up to their older brother – a coding whiz kid with a smile that charmed professors. The three siblings never fought, which his father admitted was unusual. “When he was alive, I would be embarrassed to tell people that,” Chris Keefer, Sean’s father, said. Now, four days after his son’s death, it’s one of the first stories he shares. As Chris Keefer spoke to more than 200 of his son’s former classmates on Friday, he held his wife, Christine, and daughters tightly, just like he did Tuesday night when the family learned of Sean’s death and comforted each other by staying in one bed. The Keefers, who live in West Linn, Ore., had last heard from Sean on Sunday night. The family had missed his call while the four of them played a board game, but then couldn’t reach him. Sean Keefer, who died Tuesday, was known by professors as their star student. He was learning Ph.D-level material as a freshman and was in the University’s most prestigious academic scholarship program. “We got his voicemail, and he mentioned to us that he was lonely. And we called him back and we didn’t hear back from him,” Chris Keefer told the packed room of students, professors and administrators who gathered in Ames Hall to celebrate his son’s life. The freshman – a computer science and mathematics major in some of the University’s most prestigious academic programs – was found dead in his bedroom in West Hall on the Mount Vernon Campus on Tuesday. The city’s chief medical examiner has not released the cause of Keefer’s death, but officers are not investigating it as a homicide. Chris Keefer, who said he had not prepared remarks ahead, asked that students learn from his family’s tragedy by not giving into their own loneliness – and to look after each other. “The pain that we have been through, I realized that that pain resonates to all of you. And I look at your faces, and I don’t know who you are, and I know that, unfortunately, my son ended up going to a dark place. And he went to a dark place alone,” Chris Keefer said. He added that he didn’t want anyone who knew his son to feel guilt. University President Steven Knapp, who came to the podium minutes after meeting with the Keefer family, praised the top-achieving freshman for his kind and compassionate character. He stressed the importance of healing as a community. “This is the kind of event that reminds us of the importance of being a community of taking care of ourselves, taking care of each other,” Knapp said. 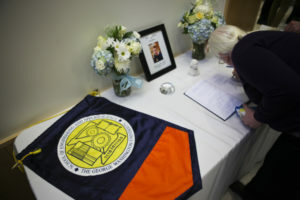 Others who spoke at the memorial, including Dean of Student Affairs Peter Konwerski, echoed the call for companionship in the wake of Keefer’s death. More than 200 people attended the University’s memorial service on the Mount Vernon Campus on Friday. Keefer had that tendency to help others, friends said. Ryan Rothstein, a former Jesuit High School classmate who is now a freshman at Catholic University, said Keefer had helped him through his own tough period in high school by eating lunch with him their freshman year. Some of Keefer’s high school classmates held their own memorial services for him, at schools including University of Oregon, University of Notre Dame and Boston College. 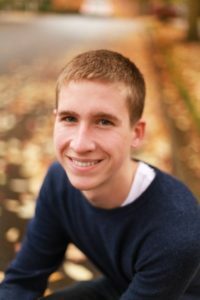 When he came to GW, Keefer had already taken every possible math class at his high school and the local college, Portland State University, his father said. He received his first computer at age 13 and taught himself to code. Just a few weeks after Keefer arrived at GW, he emailed the head of a data-driven transparency company called the Open Gov Foundation and announced that he was going to create products that would change lives. Keefer was one of four freshmen to receive the Clark Engineering scholarship, one of the University’s highest academic honors, which his father said was one of his main attractions to GW. Even within that elite group, professors said Keefer stood out, performing on the level as first-year Ph.D students, and they were already jockeying to recruit him for their own research. Computer science professor Poorvi Vora said Keefer was bored in her sophomore-level class so she would meet with him weekly to review graduate-level coursework. While he was quiet, Vora described Keefer as a courteous “old-school gentleman” with one of the brightest smiles she’d ever seen. “I’m sorry that all of us are going to miss out on the things he was capable of doing,” Wood said.